Who couldn't love a pup like this? Picture taken a few years ago. I register my dogs with the National Kennel Club ). Why aren't my dogs registered with the AKC? Because in my opinion, unless you are planning on showing or breeding show dogs, the AKC is more bother than its worth. Contrary to common knowledge, a AKC registered dog is not any better than a NKC or a CKC registered dog--all are pure-bred and all can be DNA typed through their respective registries. There seems to be a trend lately that many AKC puppy sellers are advertising that only AKC dogs are pure-bred, this is utter nonsense and I can only guess those who are doing this are trying to justify their exceeding high prices. The AKC controls the dog show world, and they put on the shows, so if you want to show that is the registry for you. If you just want a nice pure-bred dog the other two registries will do fine. How do I know a AKC is not a superior dog? Because all the genetic faults that entered my pack over the years came from AKC registered dogs, and it took years to get the faults out of my stock. The AKC is no guarantee the breeder is responsible or ethical. 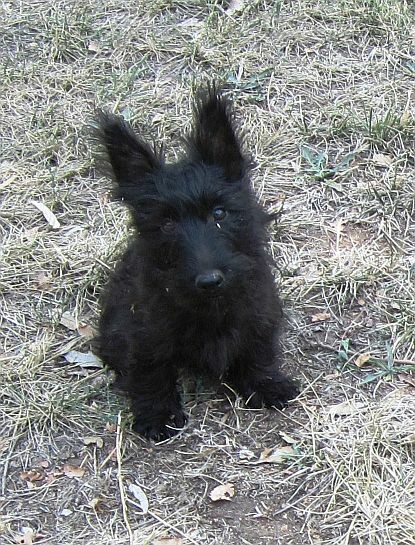 The best Scotty I bought from another breeder for stock was CKC registered--and she is wonderful--perfect. Above is one -about four weeks old. 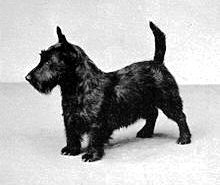 Above is a picture of the first American Scottish Terrier champion. This is what the breed is all about, tough little dogs. Notice the hair cut--this is the original scotty cut, and personally I like it alot better than what you see as a 'scotty-cut' today. 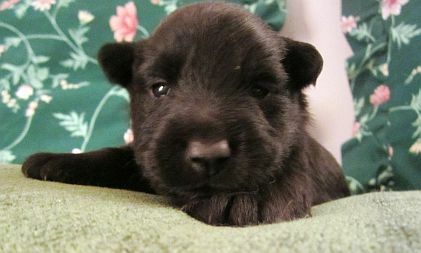 Scotties also come in all sorts of colors--the champ above was a brindle. For those of you who might enjoy the history of the Scotty, I found an old book that was written just as the Scotty was being recognized as a organized breed of its own, and it has been converted to pdf on one of the digital books sites. For those Scotty loving people out there, I am sure you will find it is fascinating read. 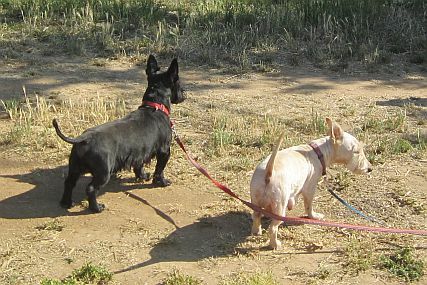 I often read in breed descriptions that the Scotty is aloof--I don't see that in my pack, my dogs are extremely friendly, love people and other animals, although they are not too hot on cats unless it lives with them. They are natural vermin killers, rats, moles, mice, are their natural prey--they were bred to keep vermin off the farm--they will take on bigger animals as well. 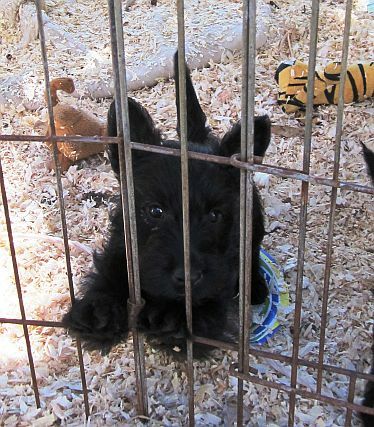 My small Scotty female--the great grandmother of these pups, broke out of her kennel and went after a skunk as big as she is--she killed it (pretty smelly around here for a while) Many Scotties are diggers, they were bred for it--its called going to ground, and they will get those rodents that burrow. These Scotties are happy dogs! They have enthusiasm and don't hold a grudge. Also I have read Scotties don't swim, many of mine swim, dog paddle right out into the creek or pond, while others don't like water, it seems a individual thing. If you take them fishing or on a boat it is best if they have a life vest. One of my previous pups went to a fisherman who takes him out with him every day--he wears a life vest--they fish in the Alaskan waters (just like you see on TV). Scotties are able to entertain themselves, and if they must be left alone for a while they are fine with it, as long as there is food and water. They also do fine sleeping in crates, all of mine sleep in their individual crate and look forward to it. It is up to you how you want your dog to settle in, they are very adaptable. Scotties make great companions, this little girl is Kenzie, a little brindle bunch of love, who charmed her new family so much they made her a facebook page, she resides in southern California, and is the center of their universe. 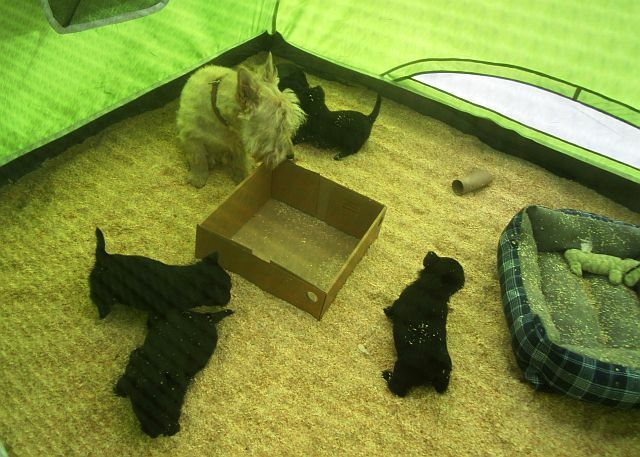 The pups in the picture are four weeks, and big enough to spend time in their playroom. Here they are with their mother exploring their new world. 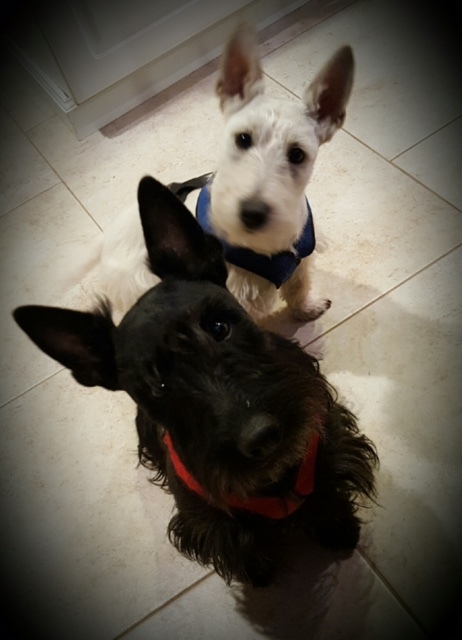 Meet Wallace, almost 3 (black Scotty) and his 1 year old son Magnu (wheaten). Wallace was from one of my previous litters and has such a sweet disposition he and now his son are in training as therapy dogs used for visiting the sick and elderly. Thanks for sharing the update Suzanne.